I am always on the lookout for a good deal when it comes to grocery shopping. If I can get a bargain that we can get a few meals out of that is even better and I am willing to drive a little bit if I have to get there. That is why I buy a lot of my meat and produce from Adam’s Farms, which is a good 20 mile drive for me but well worth it. I had also forgotten that we have a Fresh Market that is about the same distance away from here and I always found good stuff when I would go there when visiting my family in North Carolina so I signed up to get their emails and see what kinds of deals they might have. It turns out on Thursdays they do a store special called the Little Big Deal where you get the ingredients for a dinner to feed a family of f our all for the cost of twenty dollars. The run the special every Thursday and this month’s special was a spaghetti and meatballs dinner, where they included a pound of whole wheat pasta, a pound of lean ground sirloin or ground turkey or a beef-free substitute, a jar of tomato sauce, a bag of salad and a family size fruit tub all for twenty dollars. 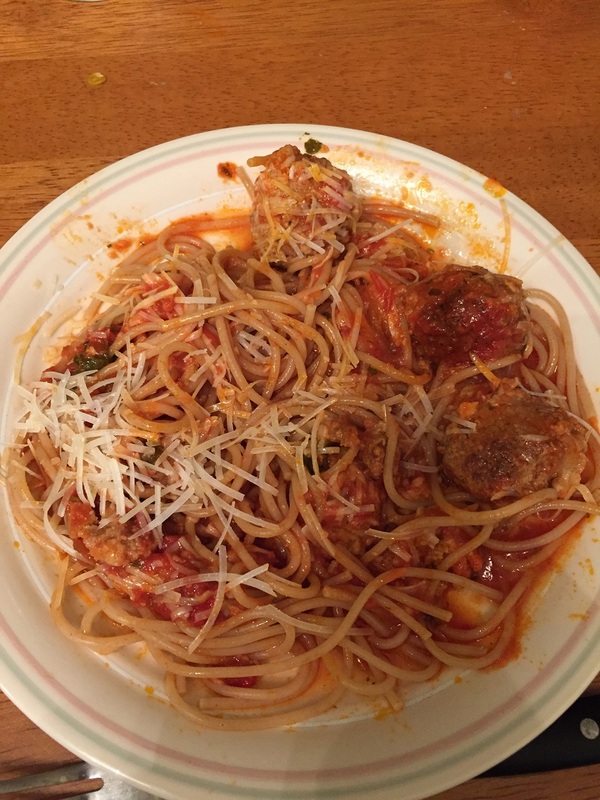 It seemed like a good deal and I had been playing to make a new spaghetti and meatballs recipe I got from Geoffrey Zakarian so I thought I would adapt these ingredients from Fresh Market into the recipe and see what I came out with. Soak the breadcrumbs in the heavy cream in a medium bowl. Heat a large saute pan over medium heat and add the oil. Saute the onions and the garlic until the onions are translucent, about 3 to 4 minutes. Add the rosemary, remove the pan from the heat and then chill the mixture thoroughly in the refrigerator, about 30 minutes. Combine the breadcrumb mixture, the onion mixture, pork, sausage, veal, Parmesan cheese, parsley and the egg in a large bowl. Using an electric mixer on low-speed, mix until all of the ingredients are well incorporated, about 1 to 2 minutes. Alternatively, mix all the ingredients by hand until everything is well incorporated, then add some salt for seasoning. Heat a small saute pan to cook a sample of the mixture. Taste the mixture for seasoning and make any necessary adjustments. Form the meatballs into the desired size and shape and place them on a wire rack placed inside a rimmed baking sheet. Chill the meatballs for about 1 hour so they have a chance to set. Preheat the oven to 425 degrees. Bake the meatballs until they are browned, about 20 to 25 minutes. Bring the Basic Tomato Sauce to a simmer in a large pot or Dutch oven. Transfer the meatballs to the pot with the tomato sauce and allow the mixture to simmer until the meatballs are tender and cooked through, about 30 minutes. Bring a large pot of salted water to a boil. Boil the spaghetti until al dente per the package instructions. transfer the cooked spaghetti to the sauce with the meatballs and toss. Add some black pepper, garnish with Parmesan cheese and parsley and serve. To make the Basic Tomato Sauce, heat a saucepan over medium heat. Add the olive oil, basil, garlic and the red pepper flakes and cook until the garlic begins to soften, about 3 minutes. Add the tomatoes, bring the mixture to a simmer and cook for 1 minute. Use the sauce right away or chill the sauce until you are ready to use it. Okay, I did make a couple of changes to fit some of the ingredients I had from the Fresh Market. First, for the meatballs I used a mix of meatloaf mix and he ground sirloin I had on hand instead of just pork and veal. For the tomato sauce, I did a mix of making the basic sauce and using the jar of sauce I had purchased, which was an organic tomato and basil sauce, so it all worked out very well. I have to say I was a little concerned about the meatballs because I didn’t think they would have much flavor and it looked like a lot of breadcrumbs in the mix that had set with the heavy cream, but I was pleasantly surprised. the meatballs turned out to be very tender and had great flavor to them. Michelle even commented that she thought they were the best meatballs she had ever had, so that was pretty high praise. We even had enough leftover so we will get another meal or some lunches out of it, so that twenty dollars is going to go pretty far. We served the meal with the salad that came with the deal (it was a Caesar salad and quite tasty) and I had made a baguette so it was a nice meal and the fruit was a great way to top it all off. Both the recipe and the deal from Fresh Market are definitely worth checking out. I love Buffalo wings and get them often when we go out or make them myself around here when I get the craving for some but lately I have found that I have really liked the boneless Buffalo wings as well. They are nice pieces of white meat chicken with some great breading and that Buffalo wing sauce. 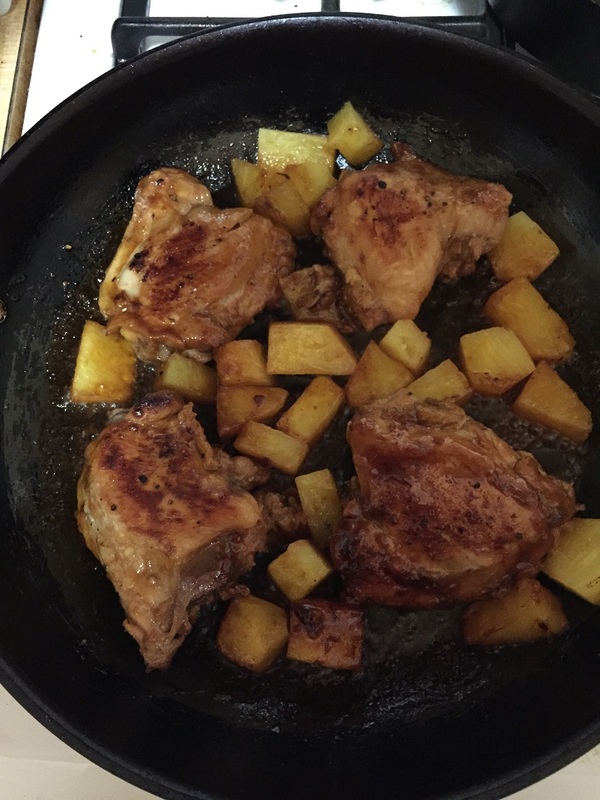 It just seems like the perfect combination and I am more likely to have boneless white meat chicken around the house than I am to have chicken wings in the fridge or freezer, so it only made sense for me to try out a recipe and see how I would like it. 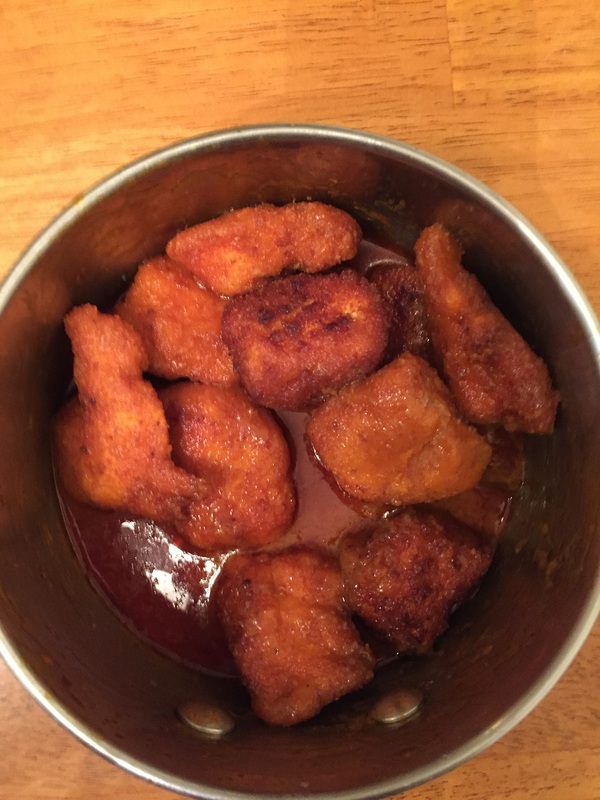 I had just recently had some of Chili’s boneless Buffalo wings when we were there one night so that seemed like a good recipe to try to replicate as my first one out of the box. I easily found a copycat recipe at Todd Wilbur’s website Top Secret Recipes so I went about giving this one a try. Combine the all-purpose flour. salt, black pepper, cayenne pepper and paprika together in a medium bowl. In another medium bowl, whisk together the egg and the milk. Slice each chicken breast into 1/2-inch size chunks. Heat the vegetable oil in a deep fryer, Dutch oven or large cast-iron pan until the oil registers on a thermometer 375 degrees. In batches, dip the chicken pieces into the egg mixture, allowing any excess to drip off, then dip the chicken into the flour mixture. Repeat the process of dipping the piece into the egg mixture and breading mixture to give the chicken piece a second coating. Continue this process until all of the chicken pieces have been coated well. When all the chicken pieces have been coated, arrange them on a plate and chill them in the refrigerator for 15 minutes. When the chicken is done resting, drop each piece into the hot oil and fry the chicken for about 5 to 6 minutes or until each piece is browned. You may have to do this in batches so as not to crowd the pieces while they are cooking. As the chicken fries, heat the hot sauce and the butter together in a small saucepan set over medium heat, stirring to combine the two well. When the chicken pieces are done frying, remove them to a plate lined with paper towels. Place the chicken pieces into a covered container such as a large jar with a lid or large plastic container with a lid (a large zipper-top storage bag will work for this as well). Pour the sauce over the chicken in the container, cover the container and then shake the container gently until each piece of chicken is coated with the sauce. Pour the chicken onto a platter and serve the chicken with the bleu cheese dressing and celery pieces on the side. Granted it is a lot oil to use for frying but if you want to get that great crunchy coating it seems like your best option. I do have baked version that I plan to try to see if it comes out the same way, but I have to say the coating was pretty darn good on these and I really liked them. 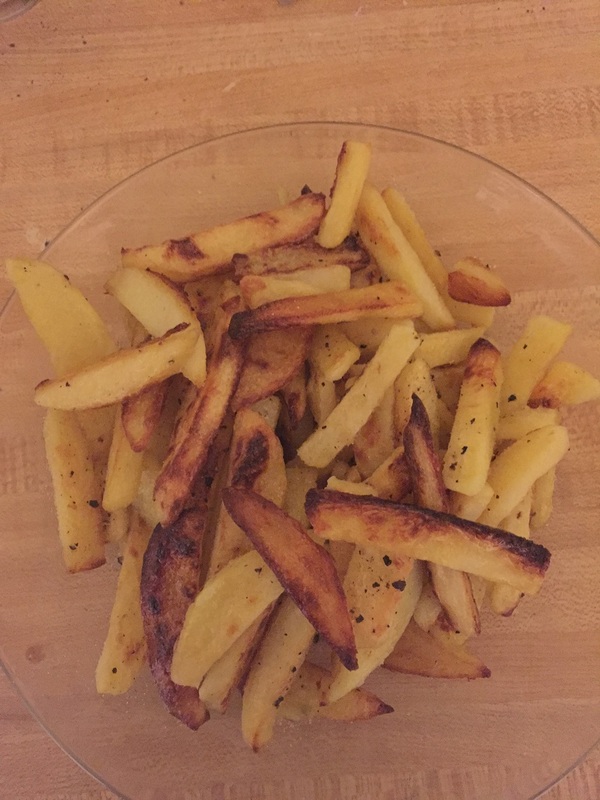 I left some without sauce because Sean and Michelle prefer them that way but I really enjoyed them and they make a great appetizer for any party or you could have them for a meal with some fries. it is definitely one I will try again. Vegetarian Comfort Food – NYT Cooking. have you decided to give up meat for Lent or for part of Lent? Maybe you just want to try to eat healthier on your own or are looking to add a meatless meal day to your meal plans for healthier eating for you and your family. Whatever the reasons may be, NYT Cooking has put together some great vegetarian and vegan recipe options for everything from main dishes and desserts to side options so you can try out what interests you the most. Check it out! I freely admit that I love a good burger but I personally have never been to a Smashburger in my life. I have heard of them before but the nearest one to me here where I live in New York is almost twenty miles away so unless I happen to be driving by one and saw it I don’t think I would go out of my way just to find the burger. Though to hear people talk about how great the burgers can be there, maybe it would be worth the trip. 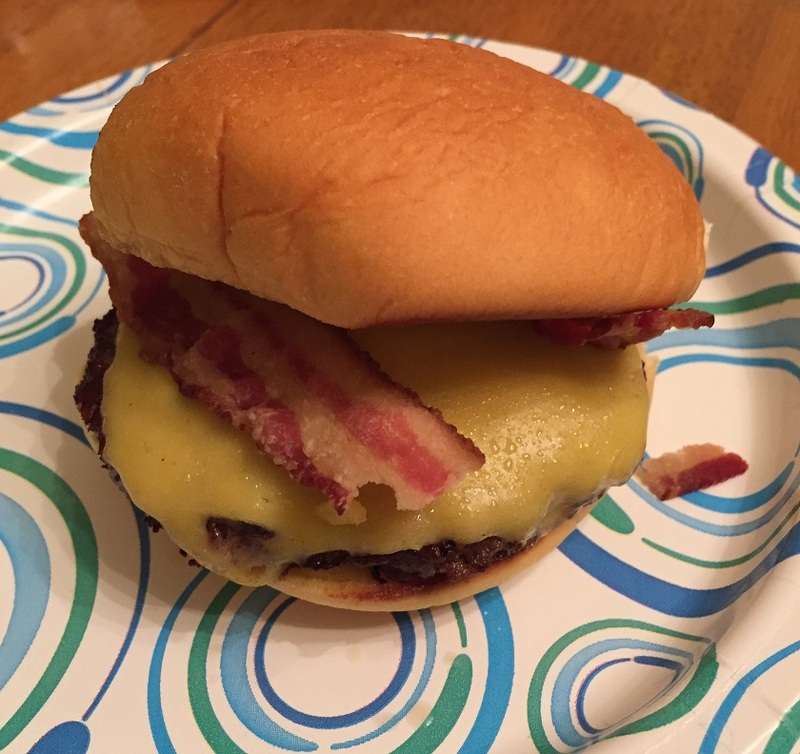 With all of hubbub surrounding the burgers they have to offer I wondered if there was a copycat recipe floating around on the Internet where I could just try to make one of my own just like they do there. I was not very surprised when I found one pretty quickly through Epicurious. Upon taking a look at the recipe it seems as though they use ground brisket as part of their recipe, something I am not likely to find here unless I asked a butcher to do it for me specifically. I opted to use ground chuck instead and the rest of the meat involves ground sirloin, which I don’t typically buy because it does tend to cost more but for this occasion of testing a recipe I figured it was worth a shot. So then I set about trying to make the Smashburger. To make the secret sauce, stir the mayonnaise, pickle juice, ketchup, mustard, paprika, garlic powder and onion powder together in a medium bowl. Taste and adjust the seasoning as necessary and then set the sauce aside. For the burgers, in a large bowl, use your hands to gently combine the ground sirloin and ground chuck (or ground brisket if you can find it or make it yourself). Divide the mixture into four equal-sized, loosely meat pucks about 2 1/2 inches thick. Place the patties on a plate lined with plastic wrap or parchment paper. Transfer the plate to the freezer and freeze the patties for 15 minutes. Do not exceed the freezing time. Meanwhile, heat a griddle, large cast-iron skillet or large stainless-steel skillet over medium-high heat. Melt 2 tablespoons of butter in the skillet and place the potato rolls, cut side down, in the pan. Cook the rolls until the cut sides are golden brown, about 2 minutes. You may need to do this in batches depending on how big of a cooking space you have and use additional butter if needed. Place the toasted buns on four plates and reserve the griddle or skillet. Remove the patties from the freezer. Increase the heat under the skillet to high and add 2 tablespoons of vegetable oil to the skillet. Heat until the oil begins to smoke. Working one at a time, add a patty to the skillet and immediately press a large spatula flat on top of the patty. Use the handle of another large spatula to hammer the first spatula down, smashing the patty until is about 1/2-inch thick. you will have to hammer longer and harder than you might originally think to do this right. Press down and slide the spatula to remove it without tearing the patty. Generously season the patty with salt and pepper. Repeat the smashing process with the remaining hamburger patties. Flip each patty when the first side is deeply browned and crisp with craggly edges, about 2 minutes long for medium doneness. Season the cooked side generously with salt and pepper, then add a slice of American cheese and continue to cook the patty until the cheese has melted, about 2 minutes longer. Transfer the cooked patties to the bottom of the burger rolls. Top each burger with the tomato slices and the lettuce. Spread the tops of the buns with the Secret Sauce and place the top bun on the burger and serve. Cast iron will serve you really well here if you have it as you can get that great sear and crust on the burgers when you smash them. I did find you had to press down and hammer pretty strongly to get the desired effect, but if you like your burgers crispy in that way this is a good way to try them. They do come out nicely and I did like the sauce you add to them rolls as it does lend some great flavor. According to the website, potato rolls are also a must here and they do seem to add something to the dish. I put some bacon on Sean’s because that is the way he likes them and I served these with some very easy homemade oven fries, which I will be sharing the recipe for tomorrow. It’s a pretty good burger and if you are hung up on the Smashburger flavor it’s worth a try to make one yourself. Quick weeknight meals have been becoming more and more important around here lately. With Michelle away on business or working late, Sean’s schoolwork and involvement in the school play and my work it has been a crunch to try to get a meal on the table some nights. That means I have been turning more and more to quick and easy ideas for dinner that I can put together in under 40 minutes so we can eat at a reasonable time and not have to turn to fast food or convenience food too often. I do try to mix things up so we’re not eating the same things all of the time (Sean does tend to complain if we are eating too much chicken). 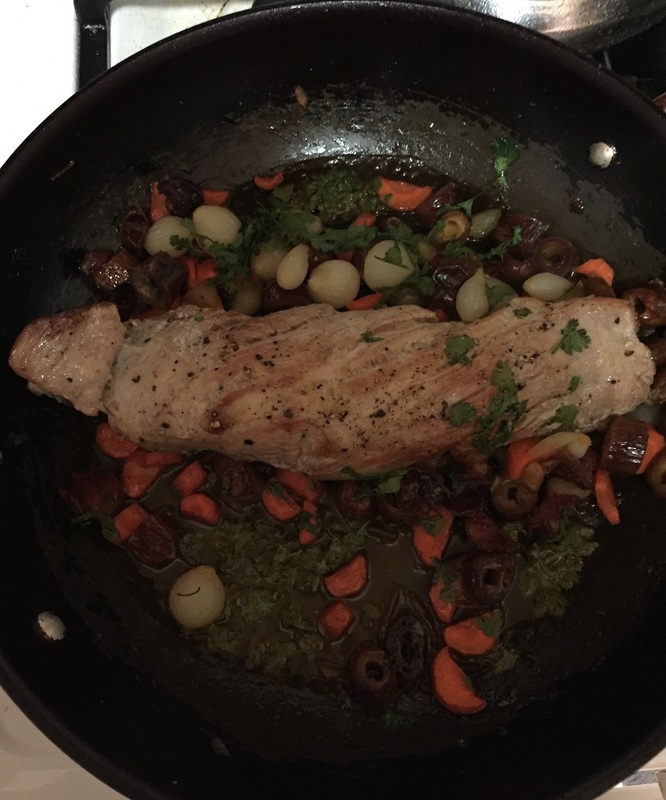 I had picked up a pork tenderloin at the store on sale a few days ago and then I saw this recipe on Epicurious for pork tenderloin with date and cilantro relish that sounded tasty and different. it only has a few ingredients to it and can come together in under 45 minutes, so I thought I would give it a try. Preheat the oven to 425 degrees. Heat 1 tablespoon of the olive oil in a large ovenproof skillet or cast iron pan over medium-high heat. Season the pork tenderloin with salt and pepper and place it in the skillet and cook, turning the tenderloin occasionally until it is browned on all sides, about 6 to 8 minutes. Transfer the skillet to the oven tenderloin until the temperature of the pork registers 140 degrees on an instant-read thermometer inserted into the thickest portion of the tenderloin, about 12 to 15 minutes. Transfer the pork to a cutting board and allow the tenderloin to rest for at least 5 minutes before slicing it. Set aside the pan drippings from the skillet. Toss the dates, orange juice, reserved pan drippings, 3 tablespoons of the chopped cilantro and the remaining 2 tablespoons of the olive oil together in a small bowl. Season the mixture with salt and pepper to taste. Spoon the relish over the pork slices and top with the cilantro leaves. I did make a small change to the recipe as I went along. It seemed to me that the dish needed a little extra crunch so I added a sliced carrot to the skillet along with some pearl onions with the pork and cooked them in the oven as well. Both vegetables picked up some of the juices from the pork and seem to add a nice touch to the relish as well in terms of color and flavor. 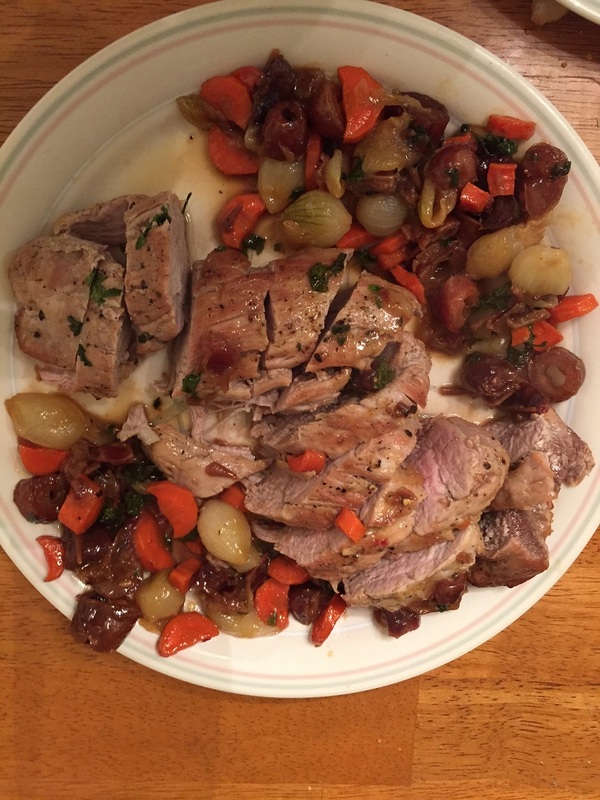 I have to admit I do not have a lot of experience using dates or cooking with them, and Sean seemed to shy away from them in the dish, but I really enjoyed the flavor they added overall to the relish and it went really nicely with the pork. I did notice in reviews of the recipe that some people added things like cranberries or walnuts to the relish as well to give it some extra flavor and take some of the sweetness of the dates. I think if you didn’t want to use dates you could easily use prunes or even grapes as a replacement and it would work just as well. I served this with some broccoli and white rice and it was a nice meal that was done quickly with easy clean up.